Herbs have much to offer in nutritional value and are an ideal addition to a healthy diet. Nourishing herbs should be consumed regularly as they offer a rich assortment of minerals, vitamins and phytochemicals which promote good health and healing. Mineral rich herbs help to replete iron stores, build strong bones, and give strength to hair, skin and nails. Herbs high in B vitamins help to buffer stress, improve mood and energy. Herbs containing magnesium promote muscle relaxation and restorative sleep. Nourishing teas are especially important at times of increased nutrient demands such as pregnancy, breastfeeding and convalescence. The simple act of preparing a cup of tea can be beneficial as a ritual of self-care. It is important that we nurture ourselves! Using herbs also helps to connect us to nature. Growing herbs in your garden or wild harvesting helps you to get in touch with the qualities of the plants and fully appreciate the medicine that they have to offer. Rich in iron, calcium, magnesium, vitamin K, selenium, zinc and potassium. As a good source of iron, the regular use of nettles helps to build blood and prevent iron deficiency. Nettles also help to build strong bones, promote muscle relaxation, improve skin rashes, reduce allergy symptoms and promote kidney function. A source of iron, calcium, magnesium, manganese, selenium, B vitamins, potassium, vitamin A, vitamin C and zinc. This herb is a wonderful tonic for women’s health as it is rich in nutrients which build blood and bones. It contains a substance called fragrine which serves to strengthen and tone the uterus muscles. It has a traditional use during the second and third trimester of pregnancy to prepare the body for birth. High in calcium, magnesium, vitamin K and B vitamins. Oatstraw nourishes the nervous system and helps to ease tension and promote good sleep. This is an excellent tonic at times of high stress. Similar to nettle leaf, a strong overnight infusion can contain up to 300mg of calcium and is an ideal tonic for building strong bones. A good source of vitamins A, C, E, K and all of the B’s; and minerals calcium, magnesium, iron and potassium. The word alfalfa is derived from Arabic and means “Father of all food” as it is such a nutrient rich food. You can eat alfalfa on salad greens or use the dried herbs for an infusion. Red clover is a source of many valuable nutrients including calcium, chromium, magnesium, niacin, phosphorus, potassium, thiamine, and vitamin C. It is also a rich source of phytoestrogens which can be helpful to enhance fertility, balance hormones, improve symptoms of menopause and treat osteoporosis. Lemonbalm is a lovely herb to reduce stress, soothe tension, improve digestion and brighten mood. I like to add it to a nourishing infusion for flavour. Herbal tea: Use 1-3 tsp of dried herbs for every cup of water. Pour hot, steaming water over the herbs and allow them to steep, covered, for 5-10 min. Overnight nourishing herbal infusion: To maximize the mineral extraction from herbs such as nettle, oatstraw and red raspberry leaf, it is ideal to steep the herbs for 4 hours or longer. For a nourishing herbal infusion, add 6 Tbsp of mixed herbs to a 1 L glass jar, fill with boiling water, and steep overnight. 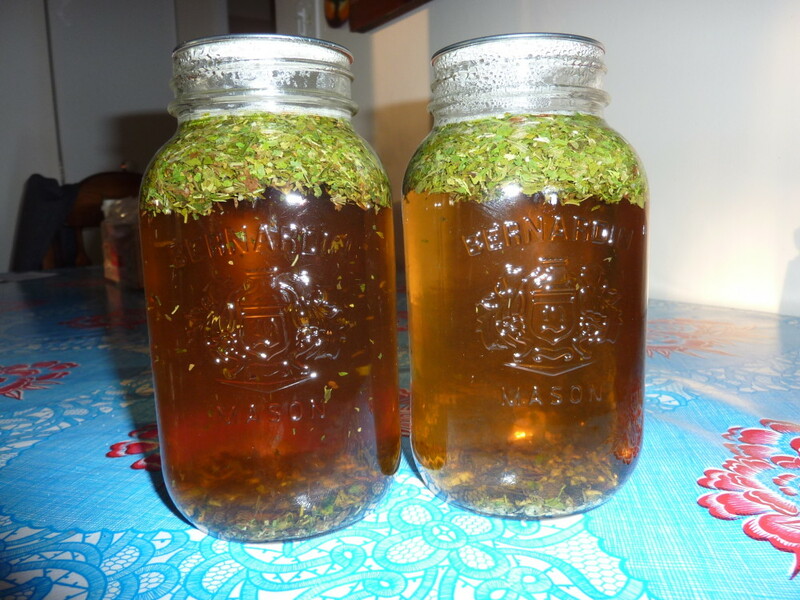 In the morning strain your infusion and store in the fridge for up to 2-3 days. You can warm up the infusion or drink it cold. Combining herbs: Feel free to use a single herb, or combine them as you please. My personal favorite consists of equal parts of nettle, red raspberry leaf, oatstraw, lemonbalm and peppermint. Flavor: Many of the above mentioned herbs have an “earthy” taste to them. You may wish to add flavourful herbs such as peppermint, lemonbalm, rosehips, etc. You can also add a splash of 100% blueberry juice for a refreshing summer beverage. Dr. Shannon Sarrasin is a naturopathic doctor who is medically trained and naturally focused. Click here to learn more about Dr. Shannon Sarrasin.